Use one (1) tablet per 350 kg (770 lb) of your horses bodyweight, once daily, ongoing as required. Simply use the required number of tablets based on your horse's weight. Our Dosage Calculator is available to assist you. Balling Gun. This is a syringe-like device especially made for administering tablets. Position the balling gun in the corner of the horse’s mouth. Gently push the tip of the balling gun to the back of the horse’s tongue. Raise the head of the horse. To dispense the tablet, push the balling gun’s plunger. Pill Gun. This is a long tube used to dispense pills and is similar to a caulking gun. Insert the tablet/s the horse needs in the pill gun. Steady your horse by holding it. Position the pill gun inside the horse’s mouth. Push the tablets to the back of the horse’s throat gently. Cut a hole big enough to insert the tablet in the fruit. Feed the treat to the horse and watch until you are sure the whole fruit is swallowed. 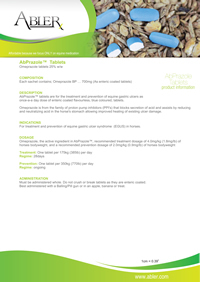 Administer the AbPrazole™ Tablets whole as crushing will break the enteric coating which is important for the effectiveness and absorption. Avoid forcing the balling gun or pill gun to your horse’s mouth to prevent serious damage. To administer properly, place the balling gun or pill gun not farther than the base of the horse’s tongue. Horses do not spit out tablets, so watch the horse until you are sure the tablet is swallowed.